Childages: 5-11 years. Children 4 and under are free. Tours each morning and afternoon. This 4-hour tour will take you to view or visit all of the following breathtaking sights in Niagara Falls, Ontario, Canada. The Canadian Rainbow Tour will allow you to experience some of the best views of the falls. 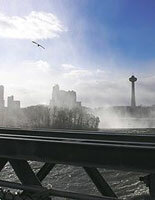 The tour includes a cruise aboard the new Hornblower Niagara Gorge cruise to the base of the magnificent Horseshoe Falls. 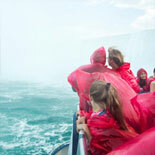 Evening tours will substitute admission to the Journey Behind the Falls for the Hornblower cruise. 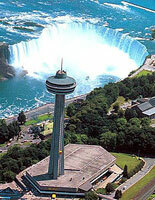 You will also ascend to the top of the Skylon Tower for a fabulous birds-eye view of all three falls, the upper river rapids, gorge, and more. Your driver/guide will be an experienced, licensed guide, who will be with you every step of the way to explain all the points of interest and to answer your questions. 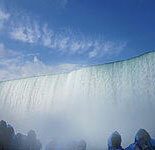 The tours have many stops that allow you to get dramatic photos of multiple views of Niagara Falls. You are encouraged to bring your camera or camcorder along to capture the action. 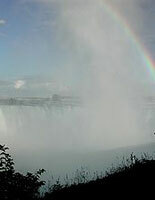 So get your eTicket today to join the Canadian Rainbow Tour of Niagara Falls . Experience one of the "Greatest Wonders of the World"! Definitely an adventure you will not forget! What type of documentation do you need for crossing the border on the tour? Residents of nations other than the United States and Canada may require a Canadian Visa along with their passport to enter Canada. Contact your national consulate before leaving home. International Visitors will require passports to cross the border. Citizens of some countries may require a Canadian Visa as well. Be sure to check with staff when booking your tour. Departures: Year round- Approx. 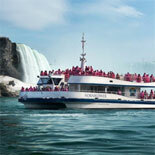 departure times 8:30am and 1:30pm Daytime tours includes Hornblower Niagara Gorge Cruise. Evening times includes Journey behind the Falls Cruise. Times vary depending on season-please confirm with reservation. E-Ticket will have details. Not available Thanksgiving or Christmas Day. Hotel pick ups available. Gray Line Niagara Falls, 1625 Buffalo Ave, Niagara Falls, N.Y.
Child Ticket: 5-11 years old. Children 4 and under are free. 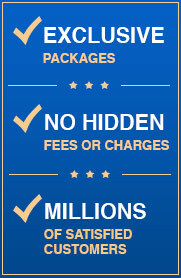 Reservations are required at least 3 days prior to your desired tour date. Customers are required to call Customer Service no less than 24 hours in advance of their tour to confirm their reservations and departure time and location (the number will be on your eTicket). + Lack of/or improper paperwork showing citizenship. Acceptable forms of ID are Passport, Birth Certificate,(for children 16 and younger) or Visa. + Prior conviction of D.W.I. + Expired passport, Visa, or Resident Alien I.D. Comfortable walking shoes or sneakers are recommended. It is always a few degrees cooler near the water; a jacket or sweater is a good idea for cooler days. 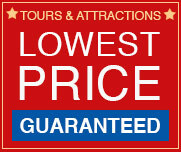 Your tour price includes ALL attractions and parking fees. You may want to bring some spending money or a credit card with you on your tour as you will be given the opportunity to purchase snacks or souvenirs. Tipping your tour guide is at your discretion.